We’d love your help. Let us know what’s wrong with this preview of Beekeeping for Dummies by Howland Blackiston. "Beekeeping For Dummies, 4th Edition" provides readers with updated information on the latest medications (even as recent as 2015 medications keep changing), new hives such as "The Flow Hive," and new non-chemical ways to keep bees healthy (called natural beekeeping).And based on reader feedback, what to do beyond your first season--thinking about your second season. To ask other readers questions about Beekeeping for Dummies, please sign up. Good for the basics, but skims the surface of some areas--like extracting--that really require a bit more depth for the beginner. Also, dogmatic, and "one right way" attitude that spoils things for me. Too much advice on using chemicals. Definitely going to buy a copy of this book. This was very detailed in everything you'll need to start up beekeeping, including blueprints to build your own hive, how to brew your own mead and various recipes. Logically organized and very helpful volume for the person interested in beginning beekeeping. I was able to locate the areas of most interest to me and save some of the less vital chapters to read as needed, such as diseases of the bee. Beekeeping for Dummies shows not only the best equipment to use, but some of the less common hives, such as the observation hive. Then it leaves us with links to places to get either a starter kit or the items needed to build or buy and keep bees, including the Logically organized and very helpful volume for the person interested in beginning beekeeping. I was able to locate the areas of most interest to me and save some of the less vital chapters to read as needed, such as diseases of the bee. Beekeeping for Dummies shows not only the best equipment to use, but some of the less common hives, such as the observation hive. Then it leaves us with links to places to get either a starter kit or the items needed to build or buy and keep bees, including the bees themselves and the all important Queen bee. Later, if all that goes well, there are chapters on harvesting the honey, and even using the beeswax. Interesting and informative. I'm going to bookmark a lot of pages here. This is the text for a local beekeeping class. It has more information than I want but I think it will be a good resource. As a young beekeeper who just started my own honey business, I found this book to be very helpful. It gave the basics on how to do virtually everything in the beekeeping world. Although I have already been in the honey business, these tips and tricks were still very helpful to me as I start my own business. This book was a very easy read and separated the chapters in a way that helped me understand the content to its full capacity. Overall, I see myself using this book in the future, even after a As a young beekeeper who just started my own honey business, I found this book to be very helpful. It gave the basics on how to do virtually everything in the beekeeping world. Although I have already been in the honey business, these tips and tricks were still very helpful to me as I start my own business. This book was a very easy read and separated the chapters in a way that helped me understand the content to its full capacity. excellent, helpful, delivered what I sought. easy to read as all Dummy books are. if you have any interest in bees, this is a great book to start with. This is a very comprehensive guide for a new beekeeper, and by and large, it does that job very well. I really liked the color photos as well as the short sections dealing with common issues that one is likely to encounter. BUT, and this is a big but, Mr. Blackiston relies extensively on toxic methods such as Apistan even though he acknowledges that mites might becoming resistant to this form of miticide. Still, it's probably a mostly small point for most people. I think that it is important to This is a very comprehensive guide for a new beekeeper, and by and large, it does that job very well. I really liked the color photos as well as the short sections dealing with common issues that one is likely to encounter. BUT, and this is a big but, Mr. Blackiston relies extensively on toxic methods such as Apistan even though he acknowledges that mites might becoming resistant to this form of miticide. Still, it's probably a mostly small point for most people. I think that it is important to try to establish healthy bee colonies without the need of a lot of pesticides. If it was just me, that would be one thing, but both 'Beekeeping for Idiots' and Conrad's book, 'Natural Beekeeping' play down the use of chemicals. will remain on my shelf for some time i would think. Having just produced my first 20kg batch of honey im looking forward to the next! This was a recommended read for the newbie beekeeper and it did not disappoint. The text was clear and the author engaging. He shared a ton of information and made the prospect of starting a hive much less fraught with fear. 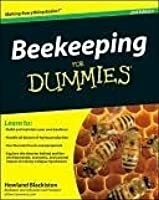 It's a "for Dummies" book so it was occasionally corny but also had value added photos, online videos, lists of equipment suppliers and contact information for various Honeybee organizations, magazines and other materials. If you are going to give beekeeping a go, you could This was a recommended read for the newbie beekeeper and it did not disappoint. The text was clear and the author engaging. He shared a ton of information and made the prospect of starting a hive much less fraught with fear. This is the first of the "For Dummies" books that I've read and I was very impressed. I had a preconception that they would be super beginner only. It does a great job of keeping things simple and making sure you have the basics but then goes on to discuss intermediate/advanced techniques in a very easy to understand way. I highly recommend it! Informative in an easy way; covers a lot of topics and gives you confidence that yes, you can keep bees (until you get to the disease section....). Good books to start with but I wouldn't use it as your beekeeping bible. My husband accidentally bought the Uk version, so a few things where different. It read all the same though and had the basic foundations any bee keeper should learn and know. Very informative and not what I was expecting for a book for dummies. 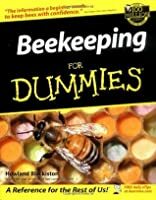 Easy to read and full of info for a beginner beekeeper or those who just want to gain bee knowledge. Learned a alot. Would have benefitted from pictures. Neither my bees or I can live without this bible of bees. Good broad-level information and handy dos and don'ts. Primarily geared towards standard hives such as Langstroth. Because I chose a Warré hive, however, there was less specific advice. This is like the textbook for beekeeping. Not the prettiest book but it's very informative. Though I would hardly suggest that if you are indeed a beekeeper, that you’re a dummy, for me this wonderful book was just the right place to begin a new (and really sticky) hobby. Since author Howland Blackiston has been an actual beekeeper for over 20 years, I felt that alone was enough proof that the guy knows his bees. Boy does he! The layout of this particular beekeeping guide was the real deal-clincher when trying to find the one-and-only. There’s an enormous collection to choose from and since this is truly my first stab at beekeeping, this book laid out a practical foundation. Blackiston takes you through the process from picking up your bees, to setting up a bee apiary (or bee yard), observing your hive from spring through summer, to fall honey harvesting and wintertime’s slumber. Of course, Blackiston reminds you, that though the bees rarely leave the hive in the winter, the worker bees are working like crazy to keep the queen warm and make sure her every need is met. One of the many great surprises about Blackiston’s approach was that throughout the book he tosses in a great deal of history as well as oodles of useful hints and advice from just where to put your hive, to different methods of harvesting honey, to properly tucking in your hive(s) for winter. Some of the more interesting facts are that beekeeping has been around for at least 5 thousand years, yet not until October 30, 1851 did the actual practice of beekeeping become a more standardized, and thus teachable, trade/hobby due to a fellow named Langstroth. Reverend Landstroth was the one responsible for devising the interchangeable hives that are still in use today. As with any all-inclusive guide such as this, there are a few things that disappointed. The main issue I have is that Blackiston doesn’t suggest many alternatives to drugs for disease management. I have always been leery of jumping on the medication train especially since I have learned (from local Beekeeping expert; Bee-Bob-Wright) that there are some really successful techniques available. Such as using powdered sugar to rid your bees of the pesky Varroa Mites instead of the more aggressive approach using chemicals such as fluvalinate or coumaphos. With names like that, wouldn’t you be a bit apprehensive seeing as everything that goes into your hive, ends up in the honey? Beekeeping isn’t just for dummies, and I don’t know about you, but I can’t imagine a summer without them. ·	This book is available from the ‘MORE’ online catalog system. I'm not a fan of the dummies books. I don't think I've ever gotten over the "dummies" moniker. Beekeeping for the ignorant might be a more appropriate title as ignorance is simply the lack of knowledge. Being dumb just doesn't seem to be a good thing to me. As with all the dummies books, it is well laid out. Plenty of margin notes, pictures, etc. The chapters progress very logically for a beginning beekeeper, ending up with information on how to purchase equipment, including the authors own webs I'm not a fan of the dummies books. I don't think I've ever gotten over the "dummies" moniker. Beekeeping for the ignorant might be a more appropriate title as ignorance is simply the lack of knowledge. Being dumb just doesn't seem to be a good thing to me. As with all the dummies books, it is well laid out. Plenty of margin notes, pictures, etc. The chapters progress very logically for a beginning beekeeper, ending up with information on how to purchase equipment, including the authors own website, beecommerce.com. The chapter pictures are pretty funny to boot. Good color photographs in the center section. Being completely new to beekeeping, I went with the authors site and purchased a very nice complete setup. There were some issues with shipping which their helpful people bent over backwards to fix. A complaint I have about this book is that it focused almost entirely on the Langstroth hive system, which honestly is the predominant system used today. However, after ordering my beekeeping gear, I found the top bar hive system on the web. For a hobbyist beekeeper who is more interested in a bit of honey and educating himself and his children, not production honey, the top bar seems much better suited. Since the author doesn't use or sell the top bar system, it seems that it gets no mention in his book. In a beginner book, I'd expect all known systems to be covered. I ordered one of each kind of hive, and before the bees arrived, I already liked the top bar hive MUCH better. The Langstroth hive system took me a full weekend to assemble ( I have kids so I'm not 100% productive). Two large supers, 10 frames each, two small supers, 10 frames each, for a total of 40 frames. 5 minutes per frame minimum once you figure it out (figure 30 mins to figure it out), a base, queen excluder, a stand, bottom board, etc, almost all to be assembled. All could have been assembled for a price but being handy I elected to do it myself. None of it is hard but it takes lots of time, like a solid weekend. In comparison, the top bar hive came in a box, ready to go. I built a stand (not required), put bees wax on the top bars and I was done. Total time, 20 minutes. Now that the bees are in, I again like the top bar hive. Mine has a clear glass on the side, accessable behind a removeable wood panel. My four year old son and I, in shorts and t-shirts, can look into the hive and see all the bees and what they are doing. The Langstroth hive requires a veil, long pants, a smoker, etc, etc. since you are opening the hive to see anything, which the bees don't take too well to. I'm sure I won't get as much honey, but I'll do better with the top bar with my kids, which was my purpose. Clear, well-written, and easy to understand. Howland Blackiston is clearly an experience beekeeper and a gifted teacher, and his explanations of many hive phenomenon were extremely helpful and complete. My only quibble, and reason for giving four stars vice five, is with Mr. Blackiston's reliance on "conventional" (newly invented and agribusiness-pushed) practices like prophylactic antibiotics, toxic persistent miticides, and queen exluders. This is what is being force-fed to most of the apiary w Clear, well-written, and easy to understand. Howland Blackiston is clearly an experience beekeeper and a gifted teacher, and his explanations of many hive phenomenon were extremely helpful and complete. Predictably, this was the first book off the pile... As a veteran of other 'For Dummies' books, I appreciate the layout and purposeful progression of the series, and this book was no exception to the rule. The book comes in an easy to read, understandable format and covers almost the full gambit of topics that a beginning beekeeper may need to know from initial questions and concerns, the gear you need, getting and introducing your bees all the way to what to check for and how to treat problems, Predictably, this was the first book off the pile... As a veteran of other 'For Dummies' books, I appreciate the layout and purposeful progression of the series, and this book was no exception to the rule. The book comes in an easy to read, understandable format and covers almost the full gambit of topics that a beginning beekeeper may need to know from initial questions and concerns, the gear you need, getting and introducing your bees all the way to what to check for and how to treat problems, and a large section on what to do with your impending honey flow, including a crazy amount of recipes. I finally took the plunge this spring (2010). Having talked about it for years, motivated by decades of avid gardening and insectophilia, I have finally joined the rather exclusive worldwide community of beekeepers. But before purchasing any bees - given my complete lack of bee-related experience - I was going to need a lot of help. 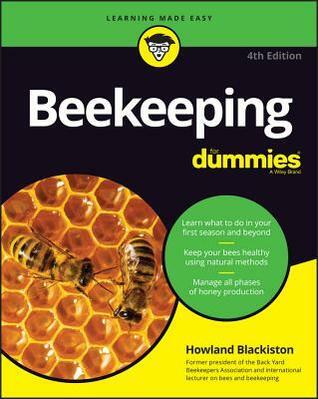 Fortunately, Beekeeping for Dummies by Howland Blackiston was able to give me just enough confidence to make me crazy enough to pursue this dream. The 350 page overs I finally took the plunge this spring (2010). Having talked about it for years, motivated by decades of avid gardening and insectophilia, I have finally joined the rather exclusive worldwide community of beekeepers. But before purchasing any bees - given my complete lack of bee-related experience - I was going to need a lot of help. 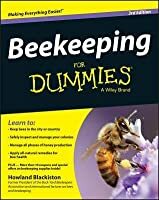 Fortunately, Beekeeping for Dummies by Howland Blackiston was able to give me just enough confidence to make me crazy enough to pursue this dream. The 350 page oversized paperback is a bestselling edition within the vast Dummies library. Apparently there's a Dummies book for everyone. You can read the rest of my review at Beekeeping for Dummies. This is a great book for any beginner beekeeper. Beekeeping for Dummies starts with the very basics and goes into the more complicated activities. This was the book that my dad and I used when we just started beekeeping and helped us out a lot. The book starts out with the introduction of if beekeeping is even for you. Next there is a section of the book set aside to knowing the legalities and also ethics of the art. The book then continues to how to start up your hive until its time to harvest This is a great book for any beginner beekeeper. Beekeeping for Dummies starts with the very basics and goes into the more complicated activities. This was the book that my dad and I used when we just started beekeeping and helped us out a lot. The book starts out with the introduction of if beekeeping is even for you. Next there is a section of the book set aside to knowing the legalities and also ethics of the art. The book then continues to how to start up your hive until its time to harvest honey. When I started looking into beekeeping a local beekeeper, Ray, recommended that I read this book to get a basic understanding for keeping bees. It has a lot of useful information on how to get started and really helped me with a basic understanding of how bees function and how traditional beekeeping is done. Throughout the book there are "All Natural" sections that reference ideas on how to keep bees with less treatments. I don't find these are a good resource for beekeeping with less treatments When I started looking into beekeeping a local beekeeper, Ray, recommended that I read this book to get a basic understanding for keeping bees. 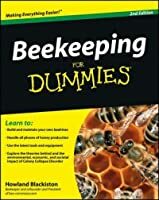 It has a lot of useful information on how to get started and really helped me with a basic understanding of how bees function and how traditional beekeeping is done. Throughout the book there are "All Natural" sections that reference ideas on how to keep bees with less treatments. I don't find these are a good resource for beekeeping with less treatments, but rather, let you know that there are other ways to keep bees. In order to find how to keep bees with less treatments I had to do a lot of online research.